Montreal producer Kaytranada’s masterful production earned him a placement on Madonna’s Rebel Heart tour in 2015, and just recently he was spotted in the studio working with the ever-so-elusive Andre 3000. His new album, 99.9%, has caused tremors with its infectious cuts. His single, “You’re the One,” featuring The Internet’s Syd, showcases his prowess on the production-side (the duo continue to win; their track, “Girl,” is also a bonafide Internet fave). Earlier this week, Kay released the video, directed by Shomi Patwary; Patwary has a resume that includes videos for Beyoncé, A$AP Rocky, Ty Dolla $ign, and more. Green Label critic Bella Jay wrote about Martin’s recent resurgence in pop culture. Read about it here. I’m one of the guys that really respects an artist’s creativity and their wishes. I told Will, “What does Kaytranada have in mind? I’ll take whatever inspiration he’s got right now going on in his head and work off of that.” They were like, “Yo, Kaytranada watched this one Martin episode where this African prince came to town and proposed to Gina.” I was like, “Yo. I do remember that episode, but let me watch it again.” So watching that and then watching other sitcoms from the ’90s started having us putting together all these random ideas. For me it was more about the look, and the colors that you’d see in those sitcoms from back then, and just the fun factor. You always see the cast members in Living Single and that intro, the way they were dancing. Or if you ever watched Fresh Prince of Bel-Air, they always had those sick dance moves and some really soulful stuff, you know? I’m from that era. I went to high school when those shows were happening. It’s very dear to me. Kaytranada is from a whole different generation than me, yet, you realize those kids appreciate that same look. They still have nostalgia for that look. It’s really not a thing where it’s for a certain age demographic. I think everybody appreciates that era. We just wanted to do it justice and just have fun with it. Who also did an amazing job was the producer. His name is Liam MacRae. He’s Canadian. A big chunk of the crew was Canadian, as well. He shoots a lot of stuff for Stussy and he took a lot of stuff for OVO. He was the Art Director on the [OVO lookbook]. They came from Canada and really did an amazing job. I told him what I wanted and they got me what I wanted. The video was shot in Chinatown, in New York. I think it was a 10-hour day. The first scene we shot was actually the party scene. You always wanna shoot all these fans that are coming out. Half of those people were just fans of Kaytranada. What you don’t want is to have them stay out all day, waiting to shoot the scene. Over the years, I’ve learned how to really work efficiently with a cast. We did the party first, but the only sacrifice was we had to do it at daytime, and my vision was for the party to be at night. It took me a while to get that look right. Now that we were shooting in daylight, we had to kind of make more with lens flares and things like that. About Syd’s cameo—or lack thereof? That cameo, we took that clip from another video that they did. I edited it in a way that it looked like she was singing to it, but that’s from a different video. It took us like a week to make sure we got that cleared from Sony. You know, scheduling conflicts and things like that make it hard. I think we would have liked to have her in the video, but then I don’t know how much it would have really fit with the concept already because I think it would have been almost forcing it to have her perform in a way with the concept we were going with. Oh, definitely. [Kaytranada’s] manager just hit me up super excited about how well it’s doing. 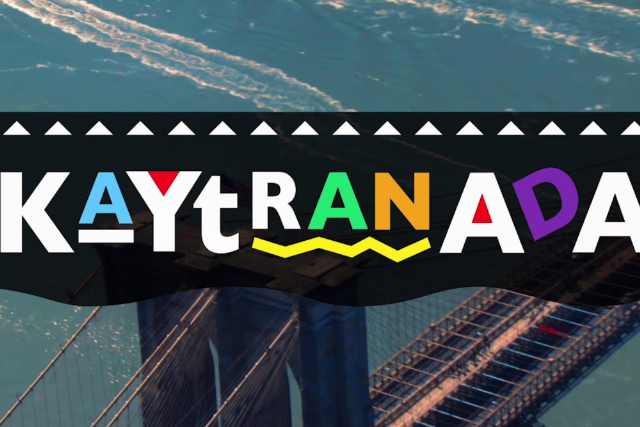 Considering that Kaytranada is still a new artist, it’s doing pretty good.